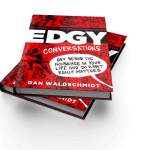 My colleague Dan Waldschmidt is launching his great new book, EDGY Conversations: Get Beyond the Nonsense in Your Life and Do What Really Matters. It just blew me away. Then again, in speaking with Dan, that’s what happens. That’s what you want to happen, if you are willing to take that one little risk in your life that changes everything. EDGY Conversations is a fresh look at how ordinary people can achieve outrageous success. Based on 1,000 stories of high performers who defied the odds and achieved personal success, the book challenges the conventional wisdom about how to achieve audacious goals and outlines the surprising truths of overcoming obstacles in business and in life. Dan’s tremendous personal and professional manifesto focuses on how small and seemingly insignificant people can do great things…. Because they have to. They choose to. They came to that point in their lives where there really is no other choice. You’ve been there too. Here’s a preview of the profound insight you can look forward to receiving in EDGY Conversations: Get Beyond the Nonsense in Your Life and Do What Really Matters. Q: What are the four behaviors you identified after looking at 1,000 high-performers that are key to producing outrageous results? Dan: We learned that high performers in business, math, sports, science or politics all share the same four characteristics. They are extreme in their beliefs and behaviors. They demonstrate a maniacal focus and discipline for getting things done. They are givers — intentionally and almost automatically. And they understand the human side of life — instead of just expecting everyone else around them to be logical, they understand how pain, fear, and failure impact those around them. While each high performer we looked at had clear, distinctive ways that they excelled above their peers, they all share these four qualities. All of them were extreme, disciplined, giving, and human. Q: When you looked at high performers in business, math, sports, science and politics what common connections did you find? Dan: The four characteristics that we call EDGY — extreme behavior, disciplined activity, a giving mindset and a human strategy — were all prevalent in high performers, even across completely different verticals, like science and sports. The same radical beliefs that enable an Olympic competitor to push themselves beyond human capacity is the exact same belief system that enables a researcher to uncover a human biological breakthrough. Despite the dramatic difference in application, the philosophies of high performers were the same. They were willing to be radical. They kept doing the same thing until they figured out how to do it the right way, yhey gave more value than everyone around thought was logical, and they looked underneath the answer for the answer to the answer. We call that EDGY. Q: Why talk about attitudes and philosophies instead of a series of “steps” that people can follow? Aren’t “steps” more practical? Dan: Simply copying the successful actions of others has never been a reproducible template for success. Times change. So do tactics. What works for someone else doesn’t work for you. Additionally, the more people who mimic a particular strategy, the less effective it becomes. The more you copy, the less you know what really works and the less you are willing to stay dedicated to building your your path. The right attitudes, on the other hand, create outcomes that are unpredictably magical. By changing your attitude, you free yourself to explore ideas that otherwise would have just been unthinkable. The “right” actions will always change, but developing the right attitudes have a timeless impact. That’s why we focus on helping readers achieve better attitudes. I highly recommend that you check out Dan’s book. Reading it just may transform your business and your life. If you order now during the book launch, Dan will even send you the EDGY workbook at no charge. GO HERE! Dan Waldschmidt is an international business strategist, speaker, author, and extreme athlete. His consulting firm solves complex marketing and business strategy problems for savvy companies all over the world. Dow Jones calls his Edgy Conversations blog one of the top sales sites on the internet. He’s been profiled in Business Week, INC Magazine, BBC, Fox News, The Today Show, and Business Insider, has been the featured guest on dozens of radio programs, and has published hundreds of articles on progressive business strategy. He’s one cool dude, too!